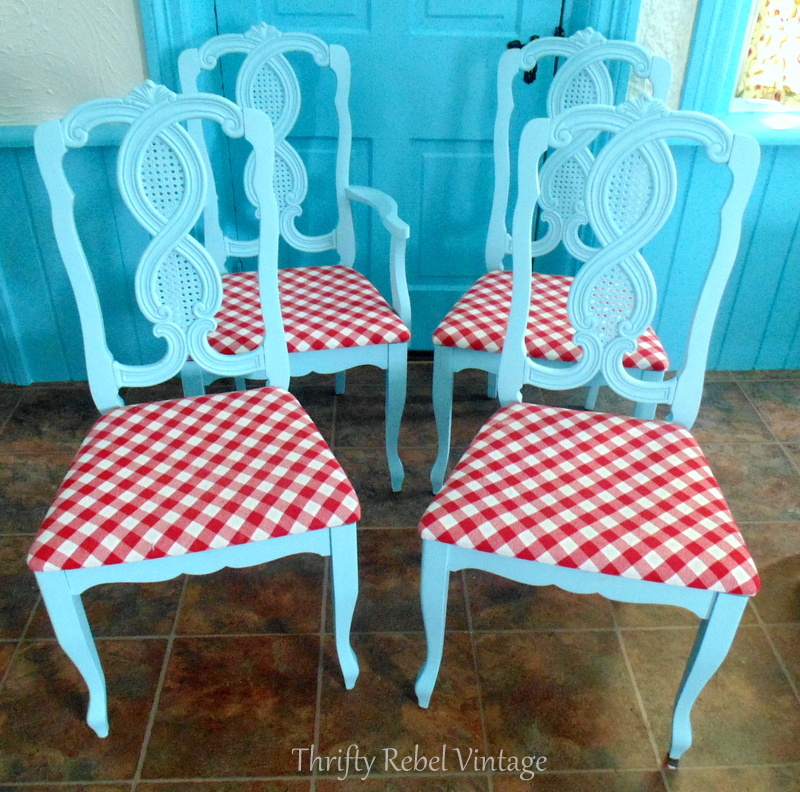 If you have some chairs that need a new look it’s so easy to give them a makeover, by simply changing the paint color and recovering the seats. 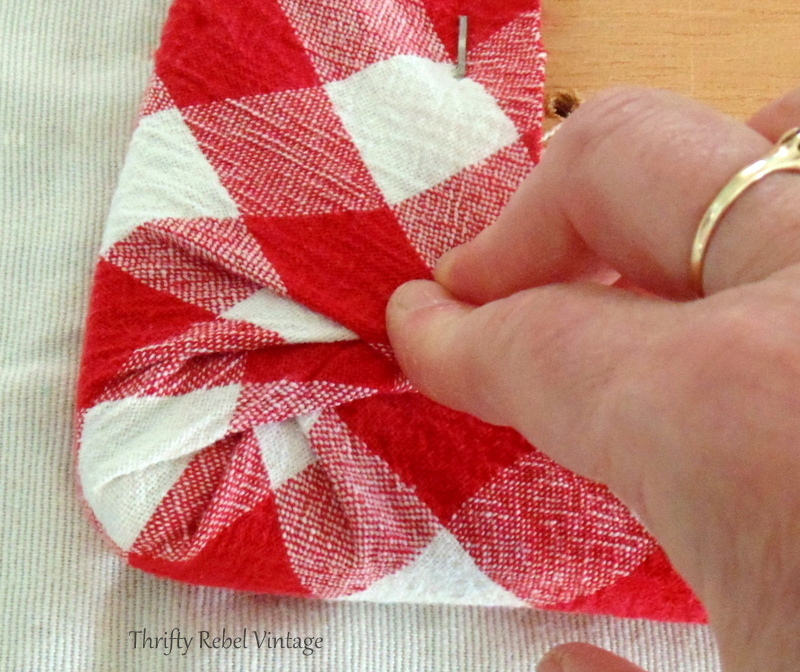 Recovering is an easy way to inject a little fun into a room with whatever fabric you choose, and it’s pretty quick and inexpensive. 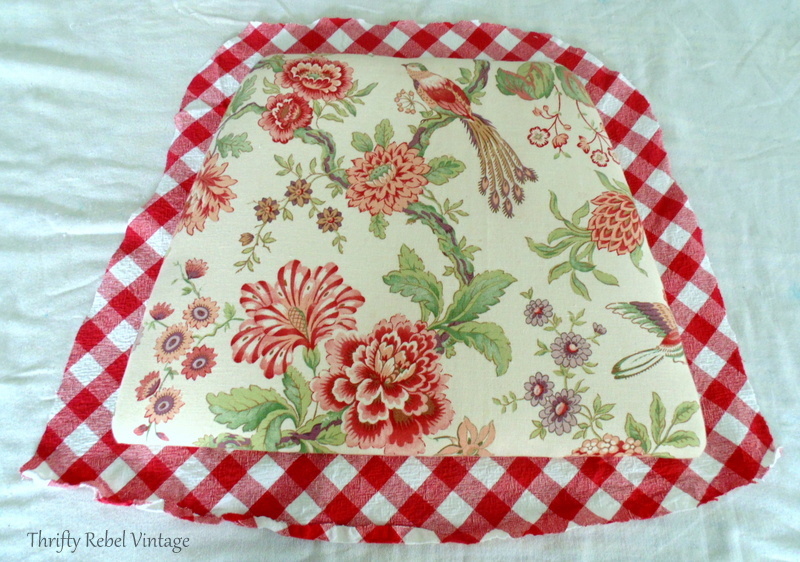 When I’m thrifting I’m always on the lookout for sheets, pillow cases, curtains, and tablecloths to be used in fabric projects like this… and I lucked out with what I’m using for my chairs. This is the table and chairs set that my parents gave us about 15 years ago. It matches the kitchen china cabinet that just had its makeover. 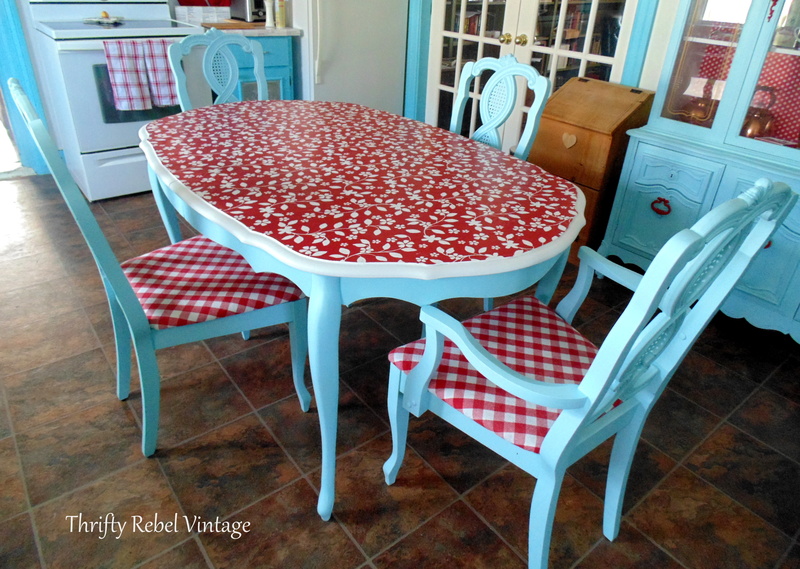 I painted the chairs and recovered the seats way back when, but I never got around to doing anything to the table. There was a tablecloth on it most of the time. 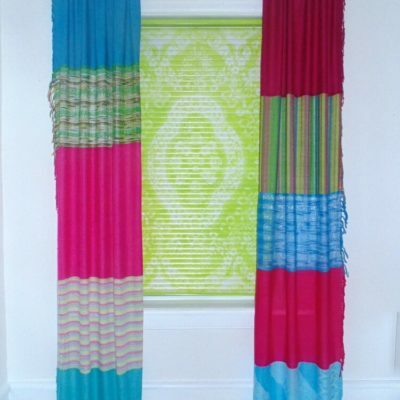 The fabric was very traditional and did go nicely in the green kitchen before, but for my aqua and red kitchen it just won’t do. 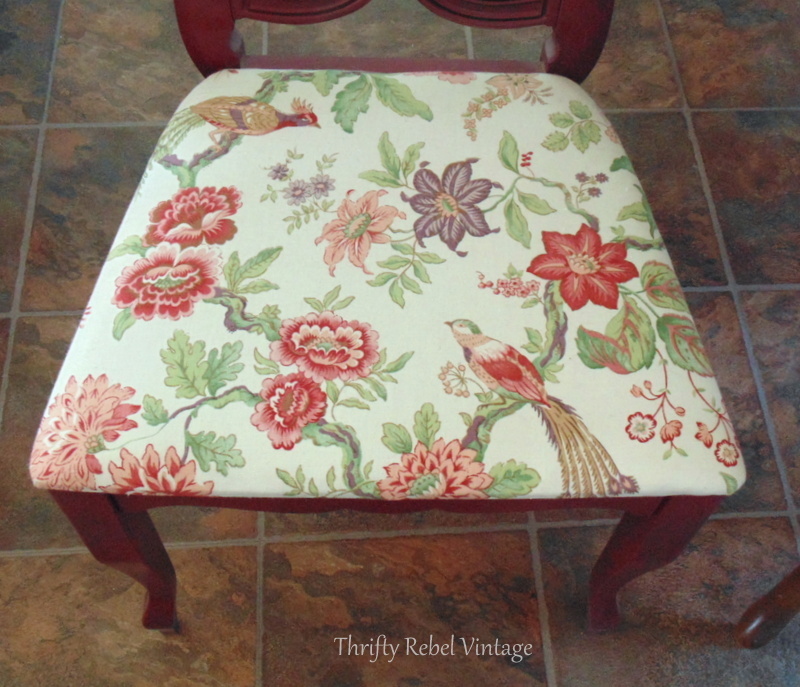 So it was time to give them a new look, and with these types of chair seats that’s so easy to do. I removed all the screws to take out the seats. 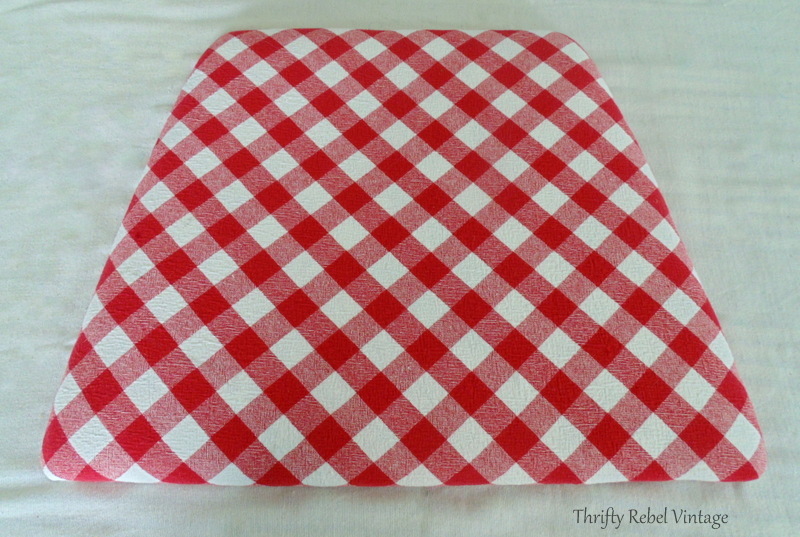 I recently found this 60 inch round red and white tablecloth for $2. It was the perfect size for the chair seats, and because it was round it was so easy to use the pattern on the diagonal rather than straight across. 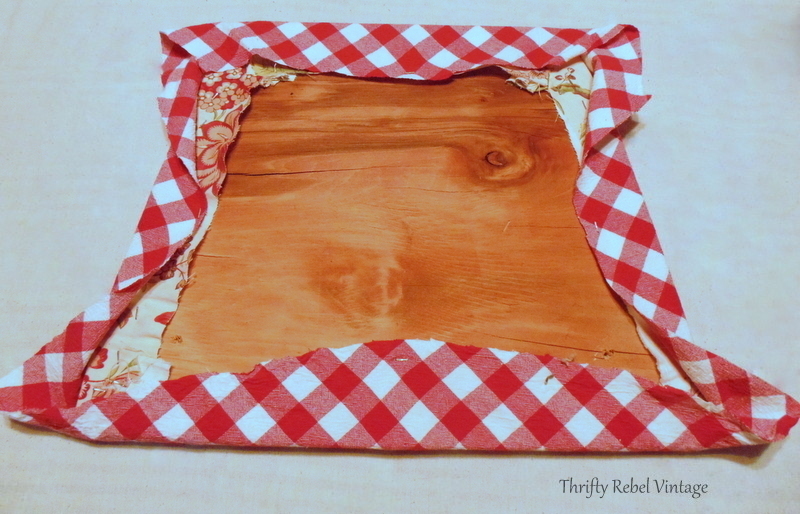 I simply folded my tablecloth in half and then half again, and then placed my seats on top. This made four sections for the four seats. No measuring required. 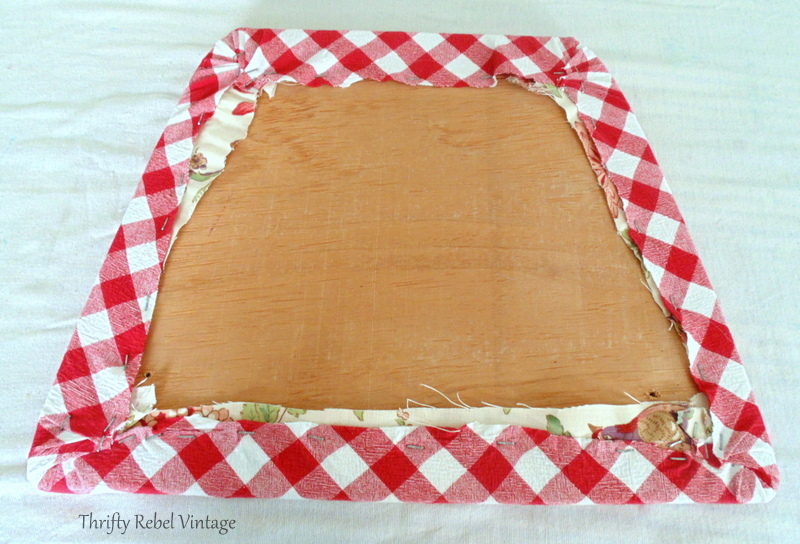 I cut my sections, making sure to leave enough extra to attach to the back. 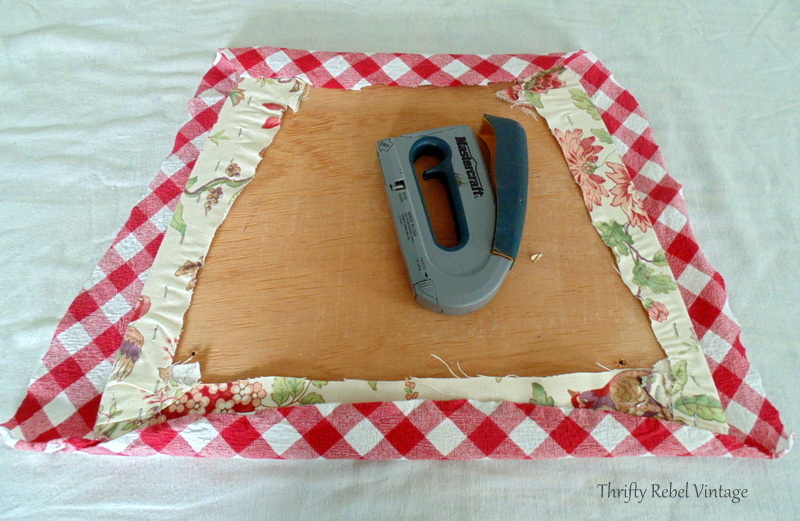 All I needed to attach the fabric to the seat was my staple gun and 1/4″ staples. 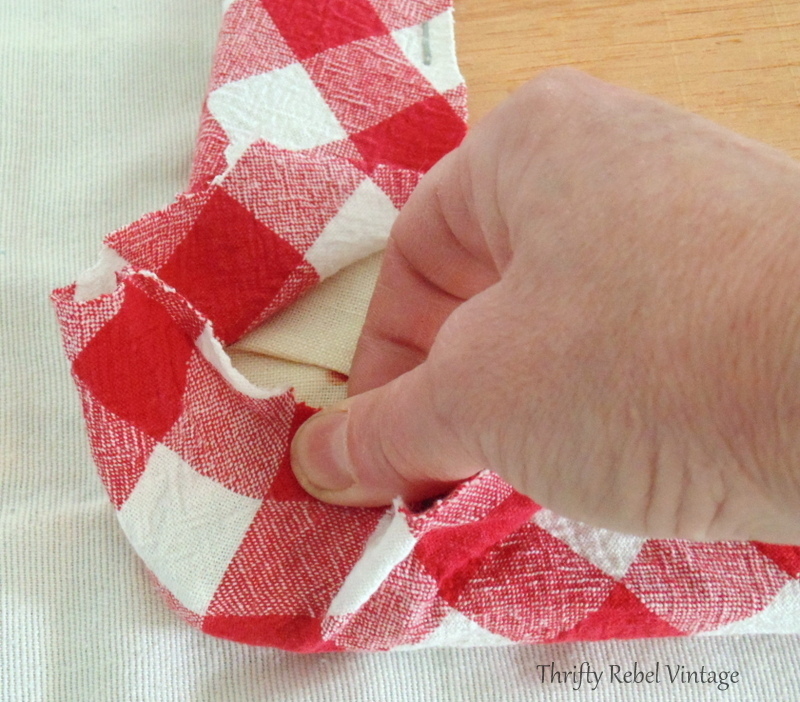 The old fabric wasn’t very thick so I didn’t have to remove it. This saved a ton of time. 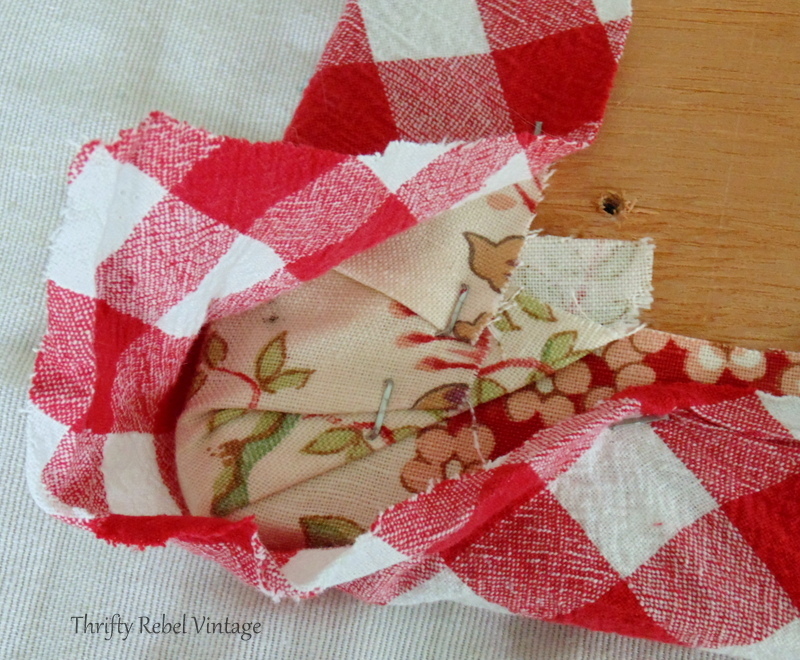 If your original fabric is very thick you may have to remove it or use deeper staples. I made sure the fabric was lined up the way I wanted it. 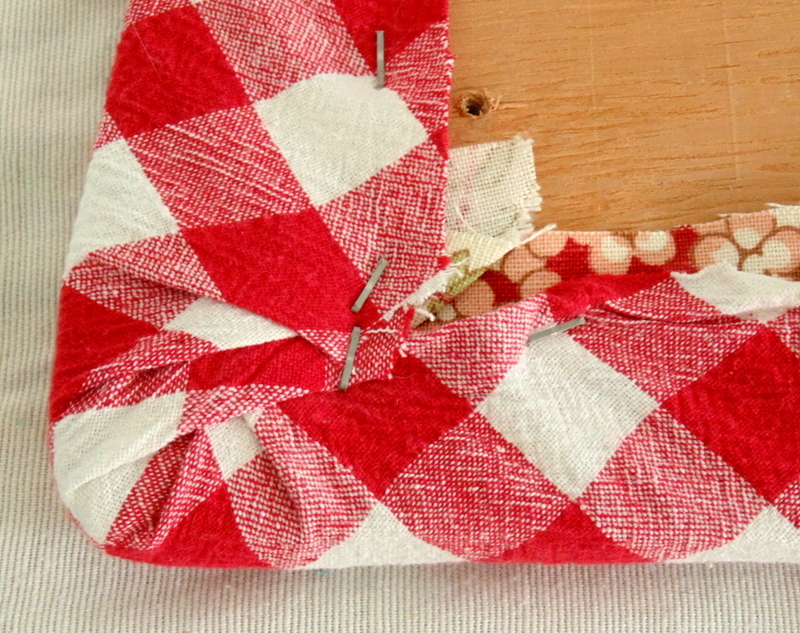 Then I put one staple in the middle of the top and bottom sections, pulling the fabric just enough so that is was tight. I turned the seat over to check it out. Because I only put in two staples if I made a booboo (which I never do, lol) I could easily remove them and start over. All was ok so I put two staples in the middle of the sides, pulling the fabric again just so it’s tight. Then I made my way with the staples from the middles out to the corners. Dealing with corners can be tricky. Start by folding the centre over, right at the corner of the seat. 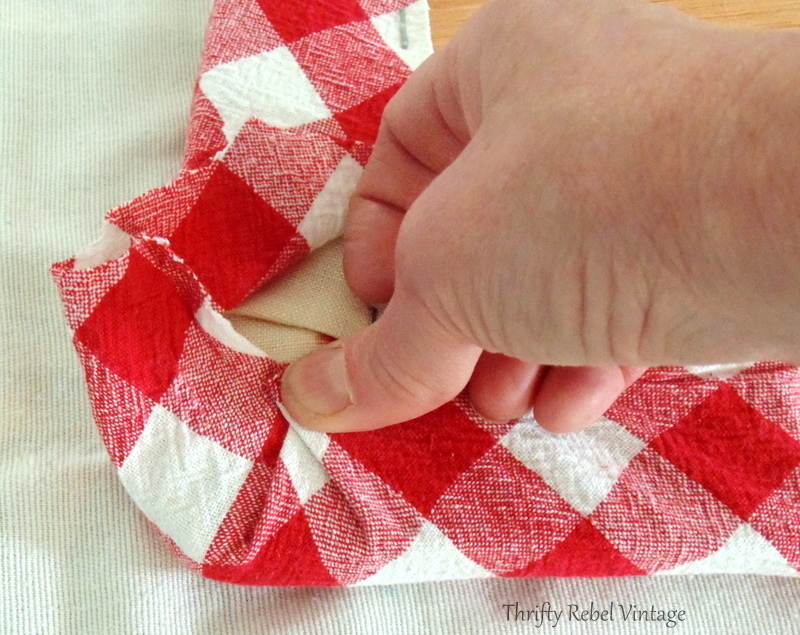 Then fold in one side so that the fabric gathers aren’t too thick. You can see I have two folds here. On the other side I have three folds. You use however many are needed to get a nice neat look. Add a few staples, and you’re done. One nice neat corner down, and three to go. Here’s the underside all stapled. And here’s my finished cushion. 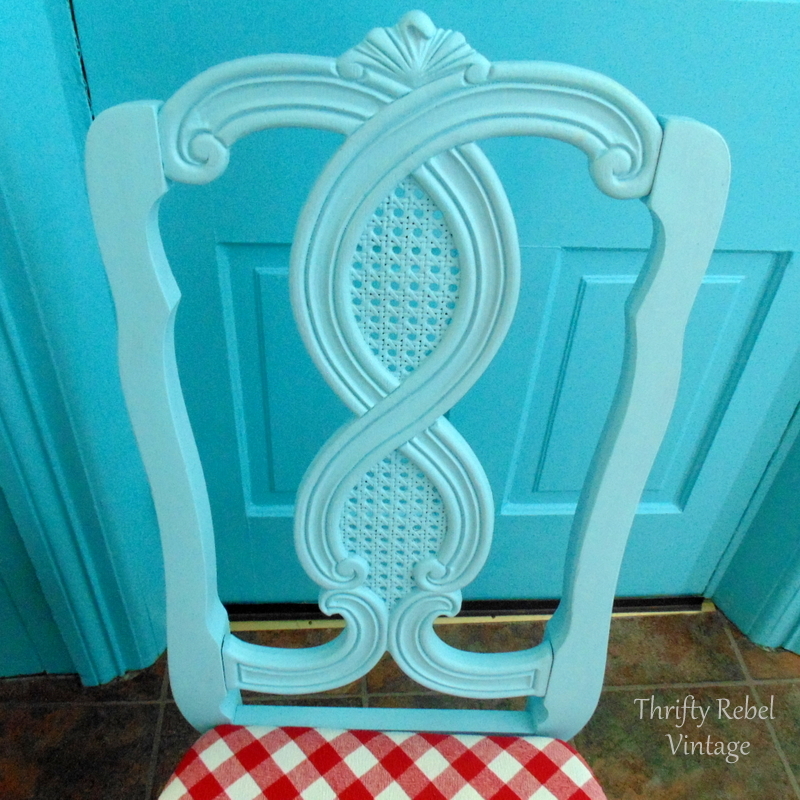 I painted my chairs with the same diy mixed paint colour that I used on the china cabinet, which is a mixture of the kitchen cabinets colour and the white wall colour. Both were water based paint and primer combos. Because the chairs had already been painted I didn’t need to sand. 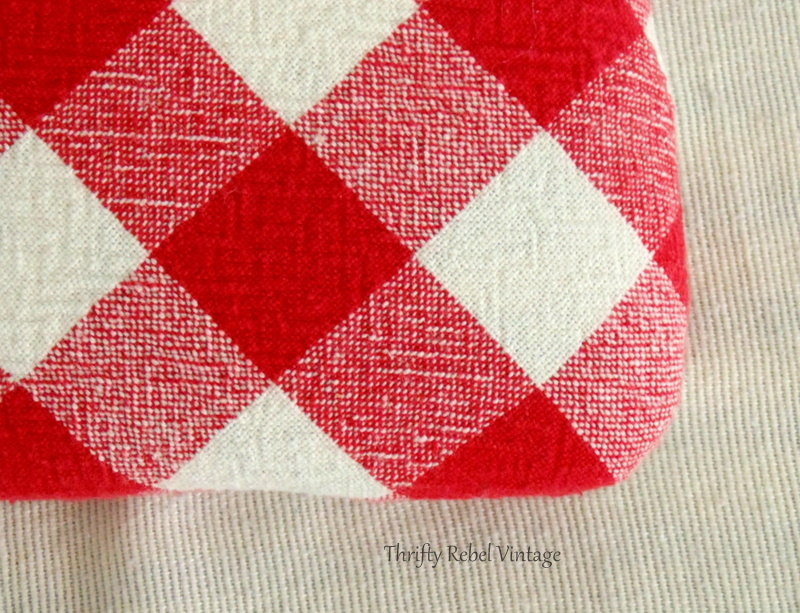 I used the red and white fabric pattern on the diagonal because I didn’t want it to look too much like my faux tile kitchen back splash. This way it complements it, but doesn’t match it too perfectly. Here’s the before of all the chairs. Painting the chairs took far longer than recovering the seats. Because of the dark burgundy colour it took 3 coats of the light aqua. My chair seats took about two hours, and I’m really glad that I went with the diagonal pattern. It just gives it another dimension of fun I think. 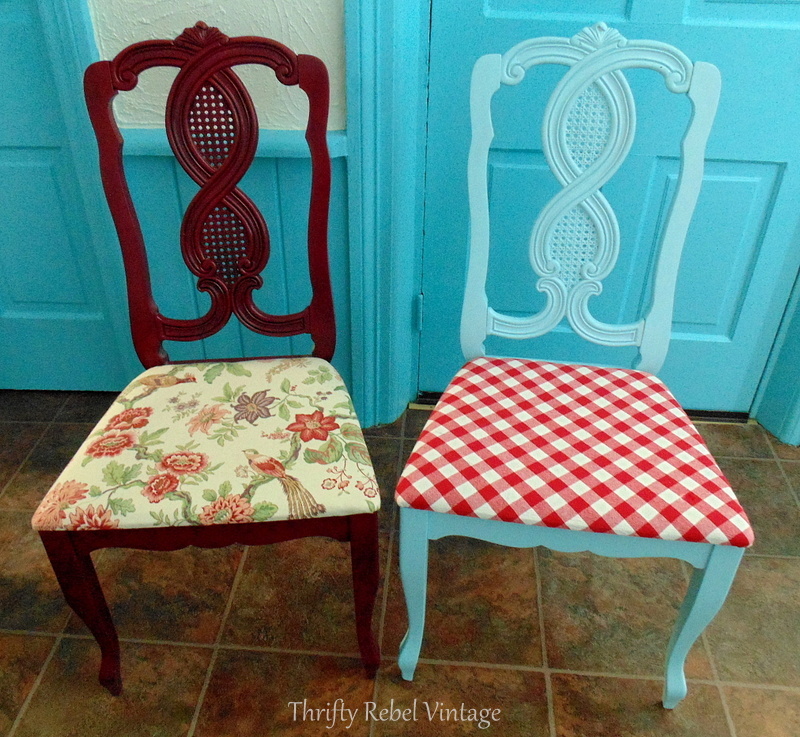 This kitchen chairs makeover cost me just $2 for the tablecloth, and I’m very happy with how they turned out. 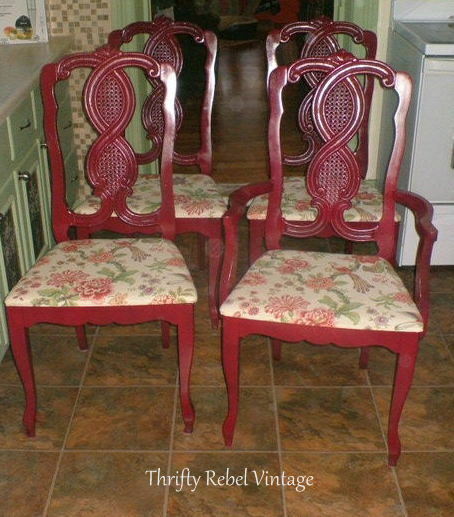 Here are the chairs with my kitchen table. 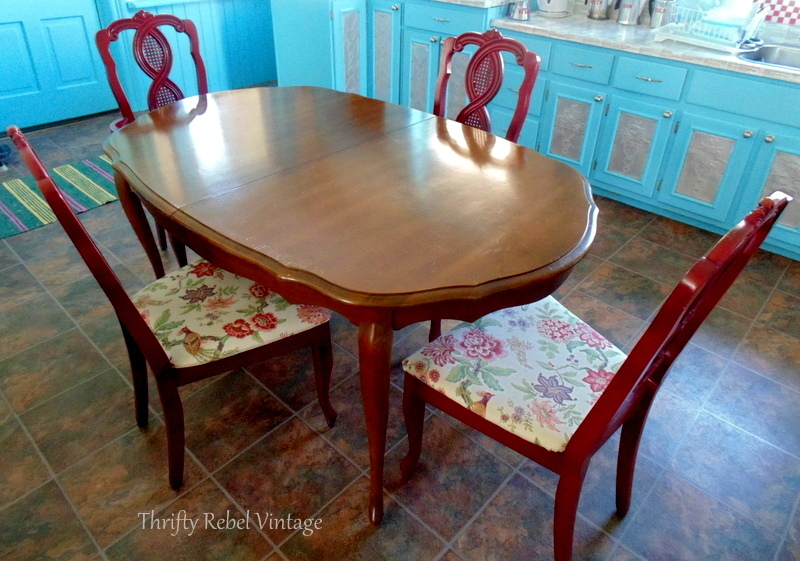 You can find my kitchen table makeover here. You can find all my kitchen makeovers here. Thanks very much Dona! I feel like I’m coming into the home stretch with this kitchen makeover soon. I love them. The aqua/turquoise color is great. 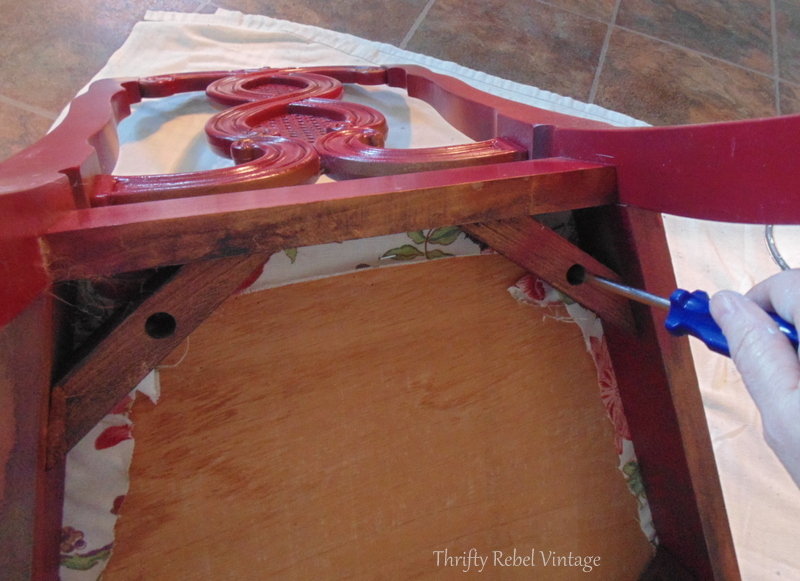 I’ve painted several variations of those colors in our bedroom and bathroom on furniture or craft projects. I’ve recovered a few chairs. I have 8 at my dining table now. They need updating. Need to find a fabric I really like to use on them. What a transformation, Tuula! I can’t believe the awesome design pattern it gives your chairs by laying the pattern on the diagonal! Your makeover is quite impressive with all of your creative thinking on each area! It’s really coming together and looking so pretty! Thanks so much Gail! I should have taken a pic with the pattern placed the ordinary way, but I didn’t think of that until it was too late. Putting it on the diagonal really made a big difference. Your corners are perfect Tuula. They look pro! Love the color choices. They really freshen up the chairs. Thanks Karen! I can’t quite believe I got this new look for just $2. Another cute addition to your kitchen! You make it all look so easy! Thanks AnnMarie! This was one of the easier kitchen projects. Really just need to know how to use a staple gun, and you’re good to go. Bravo! I love the new look! Turned out spectacular! What a breath of fresh air. Your “new” kitchen will be fantastic!! Love the new look for your chairs. The new colors really pop and placing the checked material on the diagonal really adds a little extra personality, perfect for your new kitchen makeover. Great job. Thanks very much Judy! I totally agree with you about the fabric. It just gives the chairs a little extra something. So cute!! They look great Tuula! This is adorable Tuula! 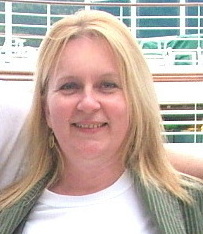 I love the fun, perky look! Loved the chair cushions before, mind you, but this does fit with your kitchen much better, I think. Pinned. 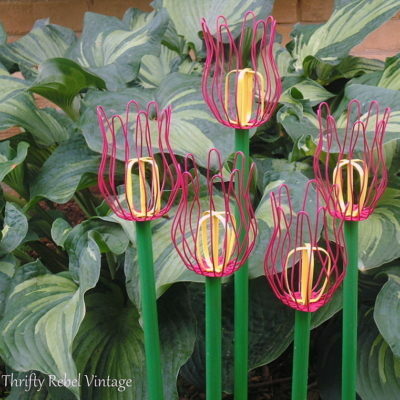 These are perfect Tuula. I just love the colors together! Great idea. 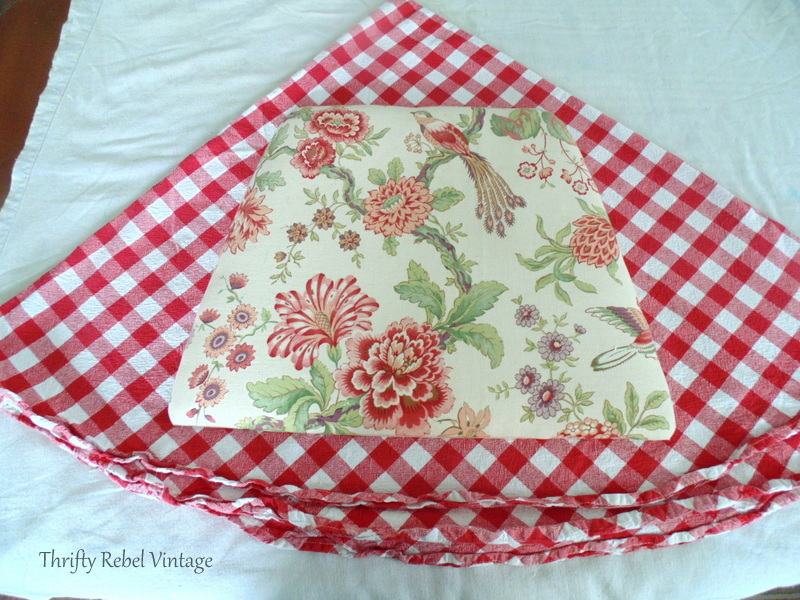 Have a beautiful tablecloth that I cut with a rotary cutter by mistake. Kept it until I had a clue as to what I should do with it. Thanks very much Diana!I’m really enjoying this kitchen makeover, but I’ll enjoy it more when it’s all done. lol. Lovity love love love! These are fabulous. I cannot believe the transformation, you see such potential in things. Pinning. Great job. Looks so professional. 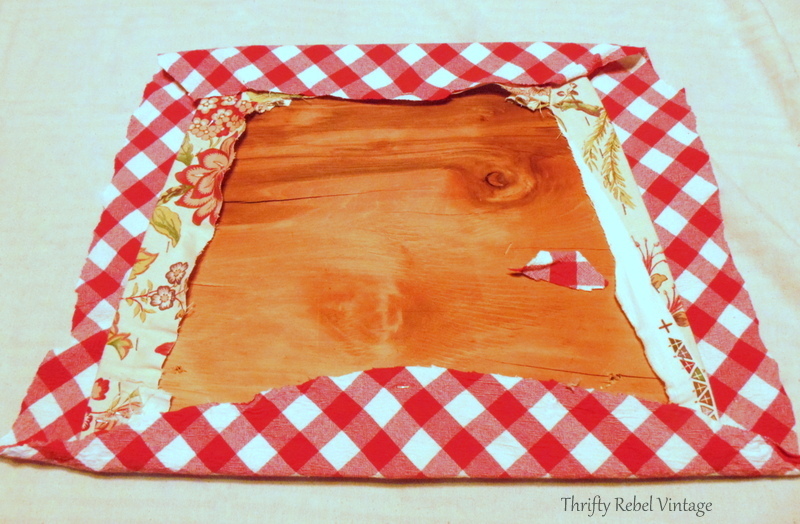 Just need my fabric and going to give this a try. Thank you.